Each Wednesday morning, Josie Danz of Zandbroz Variety joins host Mike Kapel on WDAY 970 AM radio for the “Do It All Downtown show.” It’s a weekly dose of Josie’s positive perspective on all that makes Downtown Fargo unique and special. From her more than 25-year vantage point of welcoming regulars, shoppers, visitors and neighbors into one of downtown Fargo’s longest serving locally-owned retail stores, Josie has a lot to share. On their show, Josie and Mike cover everything from new shops opening to community and art events to hot topics at city hall. Josie does a “Try, Buy and Spy” segment as her way of sharing her top recommendations and recent fun finds. She researches and shares the history and fascinating stories of the notable buildings that have served our community for generations. Something Josie and Mike do nearly every week is encourage people to park, get out of their cars and walk around. It’s really the best way to experience what is special about the neighborhood. Walking around is the only way to stumble upon the bright murals gracing the walls of more downtown buildings all the time. There’s the occasional carving or sculpture waiting to be discovered. Walking gives you a window into crazy cool alley-ways and back patios. How else will you experience the tempting smells of food trucks as they smoke, roast and fry for the lunch rush? Walking is also the way retail window displays were meant to be enjoyed. A well-designed display can make you slow, or even stop, to take it all in. Best case scenario… it pulls you into the store to browse and buy treasures. 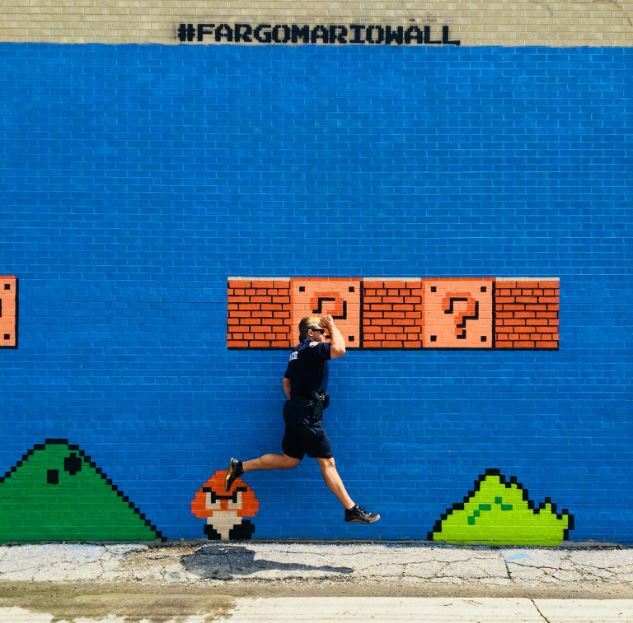 Urban retail expert Bob Gibbs visited Fargo last year and shared that the success of our small-scale downtown retailers relies on a walkability score of 85 or higher. 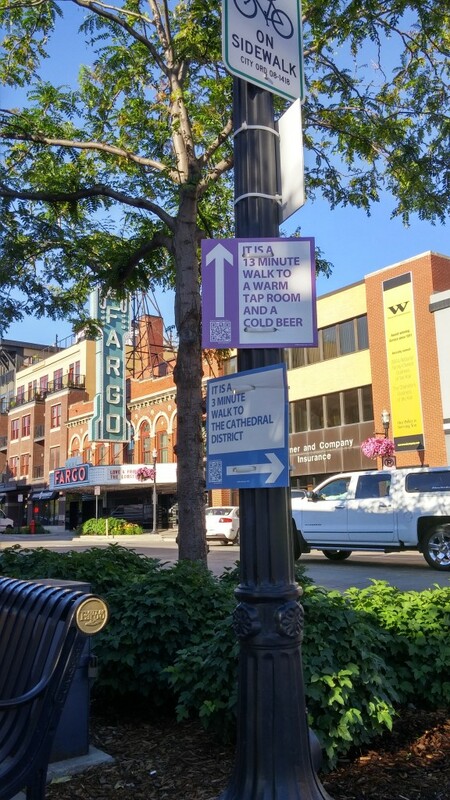 Much of downtown Fargo is at a 90 or higher per Walkscore.com. Walkability, in this case, refers to the ability to accomplish daily errands by walking. In addition to things being within walking distance, Gibbs reminded us that the walk needs to feel safe and comfortable. He noted the ideal speed for cars in front of retail is 15-18 miles an hour, which matches the description of downtown Fargo streets quite well. City and state leaders have recognized the power of taming traffic. In a recent Fargo Moorhead West Fargo Chamber of Commerce event highlighting downtown development, representatives from the downtowns of each of our three major cities shared thoughts on key streets that have the potential to be tamed. All acknowledged that street design impacts the success of a downtown. The North Dakota Department of Transportation and the City of Fargo have taken the step of studying the economic and placemaking effects of the design of Main Avenue through downtown. As a result, the City Commission has voted to support a redevelopment option that was shown to improve placemaking, increase property values and retail sales, and promote safety. The option converts what is currently a five-lane road into three lanes from 2nd Street to 10th Street. The plan widens sidewalks, maintains existing on-street parking and adds new on-street parking to both sides of this stretch. This slows the traffic, creates a more pedestrian-welcoming experience, and should spur redevelopment. Analysis and history show that this will boost foot traffic and sales to storefronts. That’s a move to spread the walkability through more of downtown. Beyond serving as a foundation for successful urban retail, designing a neighborhood where you can walk in between destinations creates inclusive opportunities for people who don’t drive. You can’t create a walkable place without slowing the vehicle traffic. Walkability creates vibrancy and a sense of place. More people on the sidewalks creates safer spaces. Lower apartment vacancy rates downtown, compared to the rest of our community, shows that there’s demand for a walkable lifestyle. It’s exciting to see walkable spaces building beyond Broadway and in our neighboring cities, making more room for people who desire walkability. As Josie and Mike are fond of inviting WDAY radio audiences, we invite you to come downtown, get out of your car and take a walk. We think you’ll be pleasantly surprised by all you discover.